Climate change is one of the gravest issues facing our nation and our planet. As I write, over 150 world leaders are meeting in Paris at the UN sponsored Climate Summit which hopefully will address many of the dangers brought on by excessive production of greenhouse gas emissions. Earth’s average temperature has risen by 1.5°F over the past century, a dramatic increase compared to the last 1000 years, and is projected to rise another 0.5 to 8.6°F over the next hundred years. Small changes in the average temperature of the planet can translate to large and potentially dangerous shifts in climate and weather. Many places have seen changes in rainfall, resulting in more floods, droughts, or intense rain, as well as more frequent and severe heat waves. The planet’s oceans and glaciers have also experienced some big changes – oceans are warming and becoming more acidic, ice caps are melting, and sea levels are rising. As these and other changes become more pronounced in the coming decades, they will likely present challenges to our society and our environment. Our reliance on fossil fuels comes with a host of dilemmas beyond its effect on the weather. We must be sensitized to the grave national security concerns created as nations become destabilized over lack of natural resources such as water. Solutions to climate change have an uneven effect on poor nations who are far less able to cope with the damaging effects of climate change than are wealthy nations and yet are being asked to help resolve a problem many of them feel they did not help create. And yet day after day we flip our light switches, boot up our computers, and drive our cars. What should we do? While we cannot remove ourselves from the necessity of using energy, we have a moral obligation to alleviate the proliferation of greenhouse gasses as it will affect our lives on many levels. Most scientists agree on what needs to be done, yet there is still doubt among many world leaders that we have the political will to carry through on what the scientists propose. Indeed the politicization of the topic in our country, in which far too many refuse to even admit to the existence of the problem threaten to divide our nation and put our planet further at risk. Although international commitments and legislation in Washington are critical in reducing greenhouse-gas emissions and increasing energy independence, our challenge at the local level, is not to wait passively for policymakers to make their next moves. Policy makers need to hear from all of you. We need to bring our communal, institutional and personal strengths to bear now. It is for this very reason that JCRC decided to convene a Protecting Creation Forum for our Jewish community to help us understand the relationship between energy, security and the environment and our moral obligation particularly as Jews. Not that there aren’t many wonderful organizations already deeply involved in the issue of climate change, many of whom are co-sponsoring this program. But because of the critical nature of climate change, we at JCRC felt the need to bring the various groups together so that collectively, we could face this issue as a community. Our goal is for you to take what you learn here today back to your organizations and synagogues. I resist the notion, and I did — I had this challenge as governor. Because, we have — look. Stuff happens. There’s always a crisis. And the impulse is always to do something and it’s not always the right thing to do. A child drowned in a pool and the impulse is to pass a law that puts fencing around pools. Well it may not change it. Or you have a car accident and the impulse is to pass a law that deals with that unique event. And the cumulative effect of this is, in some cases, you don’t solve the problem by passing the law, and you’re imposing on large numbers of people burdens that make it harder for our economy to grow, make it harder to protect liberty. Asked for a clarification, the Presidential candidate doubled-down. No. It wasn’t a mistake. I said exactly what I said…. Explain to me what I said wrong…. Things happen all the time. “Things” is that better. Having worked for the past three years in traffic safety, I refuse to settle for the laissez-faire philosophy of “Stuff happens”. This attitude is not appropriate for anyone, let alone a candidate to the highest office. If an aircraft crashes, would we tolerate a “Stuff happens’ from the FAA officials? Typically an investigation takes place and remedial steps are put in place to prevent the same type of accident from happening again. Airplanes crashes are now extremely rare. In the words of Stephen Colbert. One of the definitions of insanity is changing nothing and pretending something will change. Let us take traffic fatalities as an example, my current area of research. Improvement in safety is usually measured by the number of deaths per 100 million vehicle miles. This rate was dramatically cut through the years from 24.1 to 1.1 between 1921 and 2010. These results were the direct outcome of improved technology (seat belt, airbag, active safety), improved education, and changed behaviors. When child injury researchers observed children deaths that were caused by the airbag deployment, she took on the airbag manufacturers to improve both technology and legislation. Airbags are now safer for everyone. Of course, crashes still happen, we lose over 30,000 people every year but my colleagues and I work hard towards safer roads. Emergency Braking and driverless cars will hopefully bring us closer to the “Vision Zero” when no one dies on the road. Coincidentally, deaths by guns will surpass car fatalities this year, and we are due for change. So I believe it is important for everyone to live with the Jewish idea of tikkun olam in mind (repairing the world). Parents should be responsible for the emotional well-being of their children. Teachers, classmates and co-workers can sometimes observe distress and help. Legislators are in the front line as well and we need to hold them responsible if they do nothing to help us prevent the next massacre. Simple steps like background checks or anti-straw purchase legislation would do much to stanch the needless loss of life and limb. As hard as it is to set change in motion, we cannot and should not become insensitive to “stuff”. We cannot and should not feel powerless. Imagine living in the Middle East studying political science with an emphasis on conflict resolution. Nothing could be more present, yet at the same time, nothing could be more abstract. I’m my last year at the Interdisciplinary Center (IDC) in Herzliya, Israel (Israel’s only private university). I decided to avail myself of the unique opportunity to study “abroad” at Koç University in Istanbul. I’m from L.A. and I graduated from Santa Monica High School, so you would think that going to college in Israel would be foreign enough for me. When I was told that no one from IDC had been sent to Turkey since the Mavi Marmara flotilla incident. I signed up right away. In the classroom I learned to simulate situations and to analyze societal crises and cleavages. What I desperately wanted to experience was how to acts on my convictions. I wanted to know the palpable side of what conflict, poverty and social injustice really mean. I knew I could not do this in school but I also knew that school was an invaluable tool in order to give meaning and perspective on the world of events. That’s why I decided to take a semester off before I graduate, and insert myself into a completely unfamiliar environment where I would be forced to adapt and react. I wanted to choose a place where the conditions, the culture and the lifestyle would be almost completely disorienting. I decided on Africa. I contacted a number of organizations and schools that hosted volunteers. Many of these programs seemed somewhat diluted and overly protective in that the volunteers were housed together and remained somewhat sheltered from the population. I wanted to have as few filters as possible. I wanted to go into something pretty much blindly and find my way and create my own experiences. After a lot of research I decided on going to a small village about seven kilometers north of Kampala, Uganda. I had committed myself through a series of email exchanges, to work as a sports coach at the Kikaaya College and Vocation School in the village of Kikaaya. I’m ashamed to admit that before my trip, all I knew about Uganda was what I was able to gather from the movie The Last King of Scotland, and the gruesome 1976 Air France hijacking and the climactic rescue at Entebbe. So imagine what was going through my head as I flew from Istanbul to Entebbe International Airport. Suffice it to say I was extremely nervous and had no real idea what to expect and what was awaiting me. The school’s director picked me up at the airport at around midnight and my first 45 minutes in the country was filled with polite yet forced conversation and near complete darkness. My first impression was one of shock. The level of poverty, the absence of plumbing, and the inconsistency of the electricity astonished me. I wasn’t prepared for the overwhelming stench of burning garbage or the dilapidated infrastructure of the classrooms and the dormitories. Kikaaya seemed like a place that had been forgotten. Forgotten by whom, I don’t know. Maybe by God, or by the developed world. Either way, the place was like nothing I had ever seen before. During my first days I was taken around the village and was briefed on my tasks and duties at the school. I was to be the sports coach and the computer science teacher. The computer ‘lab’ was consisted of about six or seven functioning computers from the early 2000’s serving about 700 students. The sports facility was a large, empty pitch of grass. Even with my limited experience I was able to see how much could be done to alleviate the school’s distress by the simple and responsible allocation of funds and labor. I spent almost two months living with the staff and children of the Kikaaya College School. I was the only white person that I saw during my time there. And to say the least, I felt like I had been adopted into a big extended family. From the staff to the students to the other member of the village community, I felt welcome. I became close to a number of the students, and heard their stories. What was especially sad was how after a while, hearing about dead parents, childhood diseases, personal misery, and pain became oddly pedestrian. The ubiquity of hardship turned tragedy into a grotesque form of normal. But you would never know it from the bright, beautiful aura that surrounded the children of the school. Through all this adversity, the children demonstrated not only an incredible work ethic and discipline, but also radiated sheer, unambiguous happiness. Despite the unreliable power system and lack of a steady water supply, the broken down classrooms and the crumbling infrastructure, the lackluster library and outdated computer lab, these children still found a way to be motivated. Studying from 6:00 AM to 7:00 PM, the hard work and diligence these students exhibited made me, the privileged American middle-class college student, feel like a worthless, lazy, ungrateful slob. These kids were more than inspiring. They changed my life, and now I want to repay them in kind. I returned to the United States determined to find a way to help the students and community I had just left behind in Uganda. I immediately mobilized these ideas, and this eventually led to the creation of The Nation Foundation. The Nation Foundation is a non profit organization which focuses on rebuilding schools and investing in quality 21st century, up-to-date education in the developing world. The first project of the non-profit is the Kikaaya Project. Our goal with the Kikaaya Project is too raise enough money to rebuild the school top to bottom. This means new facilities, new student compounds, renovated libraries, restored classrooms and an adequate supply of class materials. It means investing in new technologies that will ensure a reliable water source, and a consistent power source. And it means helping the students with their tuition fees so that no one is in danger of suspension or expulsion due to lack of funds. Rather than post a new story, please note that this morning Komen restored Planned Parenthood for now. Hadassah sent out a press release that they are grateful for this about face. Grateful? How about relieved and vigilant. I’m keeping my money on Planned Parenthood. I hope the analysis below that I posted yesterday remains in your saved email to use the key points for future such situations. The Komen situation is a fundamental abrogation of Jewish values and any breakdown along Republican and Democratic lines on this one is a dangerous and false dichotomy. I’ve today been able to speak “off the record” with several Komen employees at a variety of regional levels. Apparently some of their staff are tendering resignations, many more are wrestling with themselves over whether to do so, given the high national rate of unemployment. The coherence of Komen’s large-scale well-orchestrated total follow-through process on breast cancer care is going to fragment, sadly, as agencies and patients debate whether to continue accepting their funding. I’m advised a woman who skips a step to avoid Komen-funded services in a care sequence, who returns later, needing funded care via Komen partnerships, can be disallowed sequence participation and funded services in some states due to existing state policies. Let us be clear, Jews can’t have freedom of religion in a country where abortion isn’t allowed and our tradition isn’t respected. As likely you know, Judaism stipulates that the mental and physical health of the mother comes first. In our tradition, abortions are not a category of always refuse or always abort, but rather a situation by situation matter for deep reflection, study and decision by the woman. Orthodox Jews would likely seek the counsel of their rabbi, as well. The majority of Jews are not Orthodox, and so we would counsel a woman with an unwanted pregnancy to seek support and guidance if she wishes — from her rabbi, healthcare professionals, family, and, if known, the man who is source of the sperm that has resulted in the pregnancy. Most Jews advocate responsible reproductive behavior, including the use of birth control, while at the same time encouraging those who are able and willing to have or adopt and raise children. Like most revolutionary (revolting feels to be a better word) acts that attack the fabric of a given society, the Komen decision has more implications than just our pillorying and de-funding them. 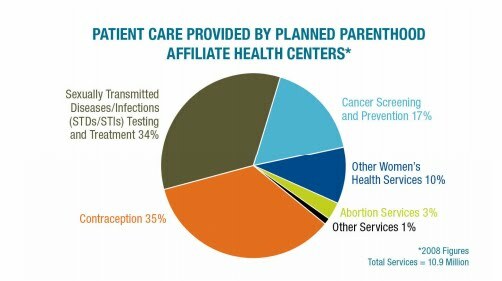 Emerging breaches in continuity of care must be addressed quickly by agencies like Planned Parenthood. Planned Parenthood for example, does mammography referrals to private and public service delivery sites, that in some states, Komen has been funding. Women’s health organizations work together, normally, to ensure continuity of coverage. So specifically, please urge Planned Parenthood to add funding or delivery of mammography to their service provision with your new or diverted donations. This is a very sad time of fissure in American society. May we all be blessed to lead inclusive mitzvah-centered, rather than self-centered lives. Rather than post a new story, please note that this morning Komen restored Planned Parenthood for now. Hadassah sent out a press release that they are grateful for this about face. Grateful? How about relieved and vigilant. I’m keeping my money on Planned Parenthood. Shabbat Shalom. House Majority Leader Eric Cantor (R-VA 6) was interviewed by Lesley Stahl on CBS’s 60 minutes. She asked him about the Jewish tendency to vote for Democrats. Cantor, the only Jewish Republican currently serving in Congress, called this the bane of his existence and revealed the Republican version of tikkun olam.